A delightful RV park near downtown, tree shaded spaces, clean restrooms, friendly staff, and adjacent to a grocery. We will stay here again when in Silver City. The only downside for us is that the local fire station is a couple of blocks away and periodically during the night the ambulance heads out with sirens blaring. 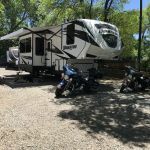 We camped at Silver City RV Park in a Tent Trailer.